Paris:la ville de les lumières, a city with almost more three-Michelin star restaurants—18—than the entire United States, itself, and a quality baguette on every block. It’s been nearly two weeks since my arrival here for a French language program, and I think I’ve gotten into the rhythm of life in Paris. Before, coming I planned on trying to keep as much of my routine as I could while modestly assimilating into Parisian society. What does that entail? A subscription to a gym so I can continue weight lifting, aiming for eight hours of sleep per night, continue eating healthy (unfortunately, that means no unlimited baguettes or cheese degustations), signing up for the public bike transportation system, and tasting (at least just once) French delicacies such as macaroons, crêpes, and foie gras. Beginning time or window of time. Activity. 6-7 a.m. Wake up. Do work. 1 p.m. Gym & Lunch/Snack. 2:30-3 p.m. Afternoon obligatory excursion with class, or, on some occasions when we don’t have any excursion, independent exploration of Paris. 3-6:30 p.m. Get home and work. This past Thursday, I visited a hip breakfast spot near my gym called Clause. The interior is blanketed in white; the countertops look spotless. A large, rectangular blackboard spans the left wall as you come in; it features the day’s specials and tells you what’s available. On the right are small, two-seat tables, and a shelf of packaged foods and baking supplies. In the far-right corner begins a staircase spiraling upwards to the main dining area. On the opposite corner, visible from the shop’s entrance is a linear staircase descending towards the kitchen. In between the two staircase stands an open-air refrigerator stand keeping the day’s freshly made sandwiches cool. By noon, the rack is nearly empty save for a couple sandwiches and fromage blanks. Recently, I’ve grown a liking for muesli, which is sort of like granola except with very little sugar. My host mom had a box of muesli in the kitchen and within days, my friend Bernardo and I devoured the entire box after we discovered it. At Clause, which is known for its phenomenal breakfasts, I found a line of muesli and granola products by a brand called Mini Magoo’s. 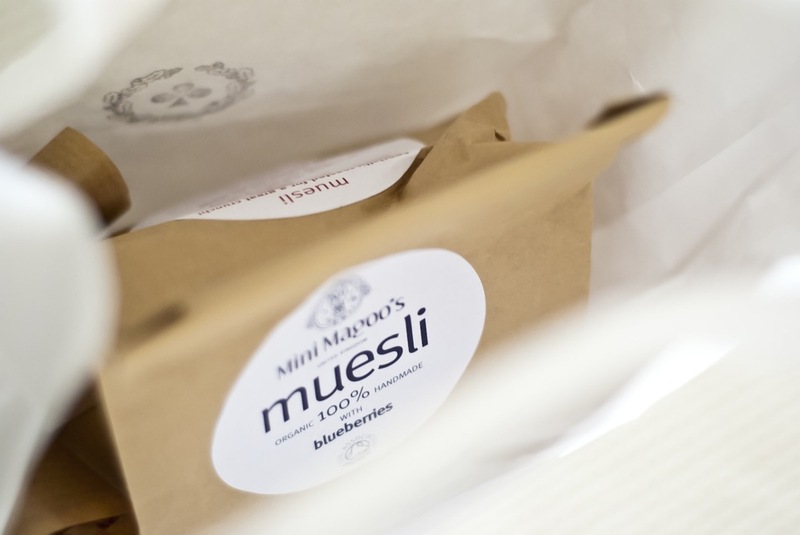 They produced hand-crafted muesli and granola with organic ingredients. Clause had samples of each muesli and granola type lying out, so after asking the cassier if I could try them, I did. 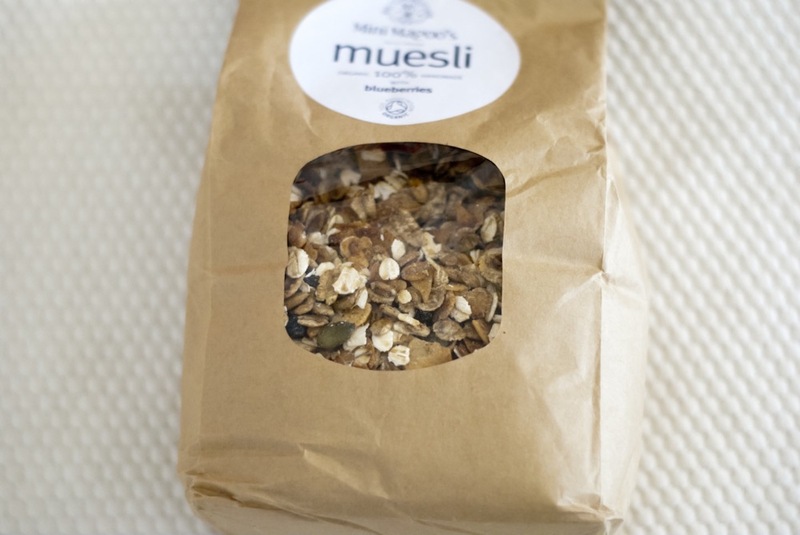 The different types of muesli generally tasted and felt the same, only varying in the dried fruit featured in each one. There was a product called Fun Stuff which composed primarily of dried coconut shavings and definitely presents more sweetness and crunch than the muesli. Lastly, a granola/muesli mix I tried comprised of puffed rice cereal, rolled oats, and nuts. I ended up buying muesli with dried blueberries. The ingredients list packs in a number of nutritious ingredients such as wheat flakes, rolled oats, pumpkin seeds, coconut shavings, and almonds. The last ingredient on the list is agave nectar, and rightly so because the muesli is far from sweet. At the cash register, my eyes skittered across a large glass jar of dried figs. Figs have always been a mysterious fruit to me because I never had them much as a child. Whenever I saw pictures of them, the intricate details of the innards always fascinated—a deep red canvas stuffed with countless seeds. 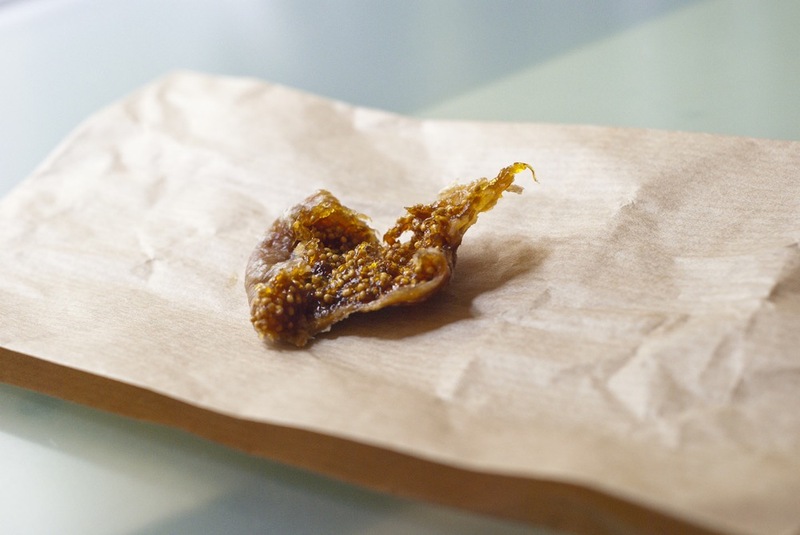 Whenever I ate fig, it was always merely a component of another dish, though the fig would unfailingly add a complexity to the dish through its herbal sweetness. 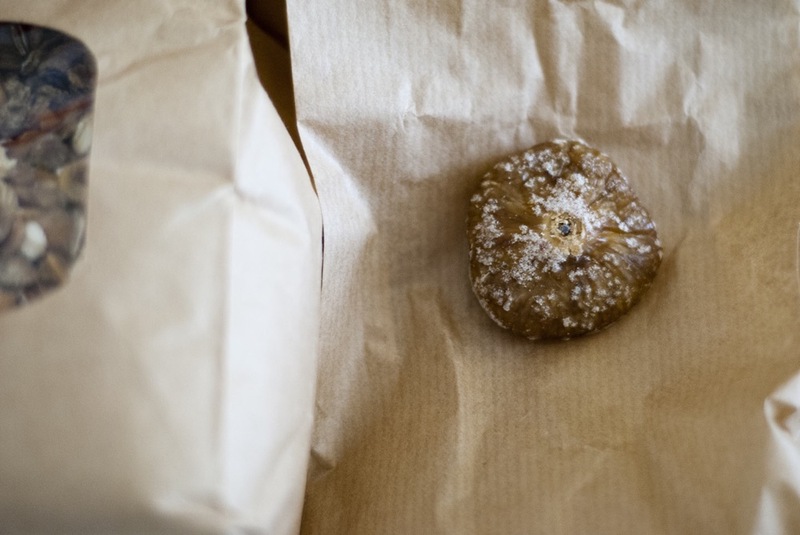 I asked to buy one fig even though they’re sold by the kilogram, and so the cashier grabbed a fig, wrapped it in a paper bag, and plopped it into my shopping bag along with the muesli. For a bit, I was confused because I expected him to weigh the fig. To my surprise, the cashier had decided to give me the fig gratuit—for free. Pleasantly shocked, I uttered an American “Thank you,” instead of a French “Merci, beaucoup,” and slipped out of the shop. Through a stroke of willpower, I managed to save the fig until I got home, at which point, I savored every nibble of the organic delicacy. The sweetness of a fig does not resemble an outright, sour nor sugary flavor. There’s a subtle hint of herbal flavors and the sweetness seems like a mature version of a strawberry’s flavor.